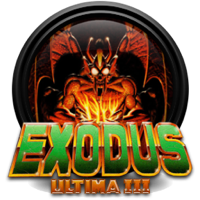 Ultima III: Exodus, is the third game in the series and the last installment of the "Age of Darkness" trilogy. It was published and released in 1983 by Origin (their first game actually) for the Apple II, C64, Atari 8bit and IBM-PC. Later ports for the Macintosh, Atari ST and Amiga with enhanced graphics followed. Compared to Ultima II, the complexity and seriousness of the game is clearly much more developed. The story of the game is much more straight-forward and to solve the game, the player has to use some intelligence too, since for the first time puzzles play a big role. The world of Sosaria has become more complex, with the player now guiding a party of four. The graphics, especially in the dungeons, are now more detailed. For the first time, there is now background music as well. All in all, a huge jump from the last installment. Exodus was the hit game of 1983 and sold very well, thus giving Origin a very good start and the needed money to created the next installment of the series. Many game creators of that time took Ultima III as a reference when creating their own RPGs. Its influence on the development of role playing games can't be measured. ▪ A cloth map of Sosaria. After the end of Mondain and Minax, the people of Sosaria think that the worst is over... but the worst is yet to come. Exodus, their offspring and creation, and neither completely demon nor machine, wants vengeance for the destruction of its creators. Starting up on a campain of terror, he rises a island from the sea and then threatens to rip Sosaria apart with his powers and armies of evil. ▪ The cloth map of Sosaria was actually drawn by Richard Garriott's mother. 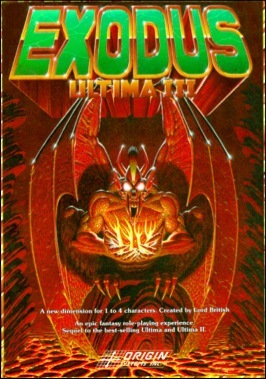 ▪ Origin became a target for several groups suspecting satanic contents in computer games, because of the demon Exodus on the cover of the game box. ▪ For the first time, a party is used in an Ultima game. ▪ The Moongates make their first proper appearance in the Ultima series. ▪ This is the first time the player can't simply kill the big villain. Exodus' nature makes this impossible. Without solving various puzzles, the player can't win the game. This is a turning point in the Ultima games–a big step from the hack-n-slash of the earlier. ▪ The NES port of the game can be completed without gathering the cards and by a party of characters less than 8 levels (possibly less) ---- This is achieved by using the moongate that strands you on the island of Exodus blocked by water on one end and mountains on the other ---- [note: this can be quite tedious but it does work] you must now pass your turn over and over to get teleported again and again by the moongate until a pirate ship is spawned within the few water tiles on the interior area of the island; take the ship over and then save the game -- from then on by sheer brute force you may enter your new ship and then the castle and hack at its inhabitants until the final chamber is conquered ---- you then get the end credits. ▪ Like its predecessors -- but unlike later Ultima games set in Britannia -- Ultima III allowed the player to choose from several different races, including Dwarves, Elves, Bobbits, and Fuzzies. It was the last main Ultima game to do so. The musical score was originally composed by Kenneth D. Arnold for the Apple II version. These tracks were converted to midi format and played on a Roland Sound Canvas 55. Click on the lute to download the music files.